Automotive. Pharmaceuticals. Telecommunications. Energy. Media. What do these industries and sectors have in common? They all outrank the financial services industry when it comes to public trust. Accordingly, the response of the investment industry to the financial crisis needs to be about greater professionalism. The financial reforms that are in full swing around the world will be incomplete if they do not also fundamentally improve the behavioural norms of those working in finance and investments, and the need to improve the values and conduct of practitioners must remain a priority. Earlier this month CFA Institute, the global association of investment professionals, and Edelman (creators of the annual pan-industry Edelman Trust Barometer) published joint research in to levels of trust in the investment industry. The survey sought views of over 2,000 investors in the U.S., U.K., Hong Kong, Canada and Australia, and found that just 53% across all those markets trust investment firms to do what is right. Retail investors were less trusting than their institutional counterparts, and the U.S. and U.K. were found to be the least trusting markets. The reasons for this crisis in confidence are manifold, and finding a solution is equally complex. Interestingly our study revealed that investors are more likely to trust individual investment managers they have worked with than investment firms or regulators, yet the majority (52%) felt that the regulators hold the most responsibility for effecting change in the industry. I would argue that if ethical, efficient individual managers hold the trust of investors, it is up to investment firms to ensure that all their investment decision makers uphold these standards, which would in turn benefit the reputation of their institutions and the industry as a whole. In many developed economies green shoots of recovery are tentatively emerging, making this a critical time to address concerns about gaps in knowledge and understanding of the industry as a new generation of professionals begin to come in to finance. The career opportunities are vast, not just in investment banking roles but in a range of other professions in the sector such as law, IT, marketing and PR, HR and compliance. As the industry returns to growth, there will likely be more career opportunities and competition for strong candidates looking to set themselves apart as the leaders of tomorrow. It is a complex professional environment to enter, navigating the myriad of global systems, processes, regulations and terminology. So how can the industry set a better example for this new generation? And how can managers change behaviours to reflect a new era in banking? Mark Carney, the new Governor of the Bank of England recently commented that banks must “reconnect with society.” To fulfill this societal mission, investment professionals must act on behalf of investors to protect and grow their savings to secure their financial future. In order to achieve this, leaders must instill a culture of ethical conduct, rigorous regulatory compliance, and create systems to report misconduct in confidence. At CFA Institute our mission is to guide the investment industry to higher ethical and professional standards for the ultimate benefit of society. The tools we have created to equip financial institutions and professionals include the CFA Program, now in its 50th year, and our new Clartias® Investment Certificate which provides a fundamental introduction to the industry for those outside of investment decision making roles. In creating the latter, we worked with industry leaders, regulators, journalists, academics, and our own members from around the globe. We heard from leading talent development professionals about the challenges that they face in ensuring that their company’s employees can speak a common financial language. We spoke with policymakers about their concern with the industry for failing to take critical steps necessary to repair its reputation. We heard from industry leaders about their frustration with the lack of awareness that policymakers and others have about the efforts they have already made. Most importantly, we heard again and again that there was an unmet need in the industry for a global benchmark of knowledge for the ninety percent of professionals in the investment industry who are not themselves investment decision makers. The benefits for firms that invest in the knowledge and education of their staff and commit to ethical practices range far beyond the macro-societal good: staff retention; organic growth through sharing within and across the business; development of more sophisticated products; attracting top talent; stronger client relationships; and so on. It is critical that the industry approaches this issue from all angles. We have seen a focus on investment decision makers themselves, but their communications teams, finance departments, IT consultants and legal counsel and how all these functions operating within the wider industry can improve understanding, performance and ethical practice. The conversation must move on from a culture of blame to a constructive dialogue about what positive solutions organisations can bring forward to restore a healthy financial system. Our call to action to the industry is ‘the future of finance starts with you’ and much needs to be done urgently. Regulators should drive the broader professionalisation of the financial sector; a greater emphasis on professionalism must properly complement and balance the regulatory and industry overhaul reshaping finance. At the same time, employers should require their most valued employees to actively seek professional status as a condition of employment; long-term competitive advantages and investor confidence could be built in this way. It will take more, much more, to restore the public’s trust in the financial services industry, but investing in education is a visible and tangible step for any company that wants to demonstrate an institutional commitment to ethics – and a belief in the fundamental good that the industry can do for society as a whole. 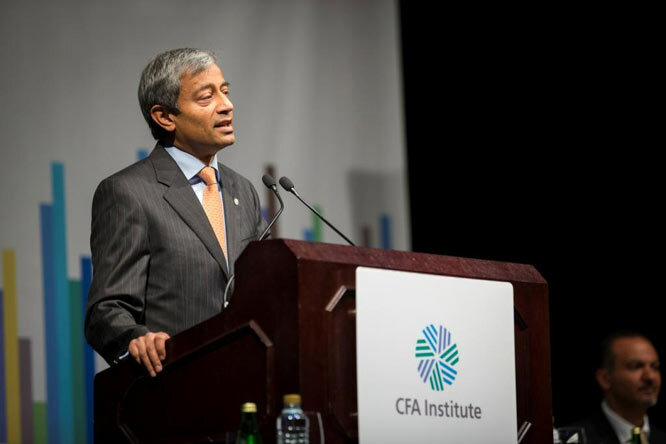 Nitin Mehta is Managing Director for Europe, Middle East, and Africa (EMEA) at CFA Institute.